Choosing weather or not to leave your pond pump running through the winter doesn’t need to be a tough task. We suggest you factor in a few things to help with your decision. If you live in a region that has very mild or even warm winters than you probably would choose to leave your pond running throughout the season as your pond will likely be unaffected with the minor change in temperature. However, if you live in a region that likely will receive below-freezing temperatures, it’s important to keep a few things in mind to properly prepare for the colder months. Allowing your Pond to circulate during the cold months will help to prevent your water from freezing compared to standing water. Also, if you have any wildlife in your pond such as fish, frogs or any other aquatic life it is best that the pond run all winter to keep the water warm enough for your pond friends to survive the winter. 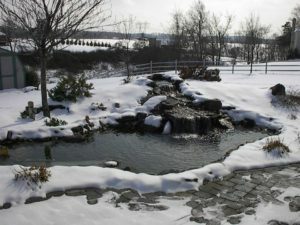 Keeping the water from completely freezing also prevents possible damage to your pond liner if it is under constant freezing, thawing and re-freezing. Be aware also of gas buildup under ice that happens when the top of the water completely freezes. This gas buildup will make the water toxic and dangerous for your fish or other aquatic life. Another way to prevent this is with a Pond De-icer. This tool will not heat your entire pond, but it will keep the area around right around it from freezing. The whole that the De-icer creates in a frozen pond allows any toxic gas buildup to escape. Keep an eye on your pond when the temperatures are below freezing. It’s okay when you see your pond becoming icy, it sometimes even forms unique looking ice sculptures around your waterfall. Just keep an eye out if an ice wall begins to build up around the waterfall and damns it up forcing water out of the pond. If this happens you can pour warm dechlorinated water on the ice to melt it. If you don’t have any fish or other aquatic life in your pond, then it could be very easy to turn your pond off for the winter. This will limit any potential winter maintenance. However, it is likely a good idea to completely drain the pond of all water. Draining the pond will limit any potential of cracks or wholes forming in a frozen pond, especially if you have a concrete or above ground (plastic) pond. Thank you for your comment, we apologize it did not post immediately after you submitted it. We unfortunately have to review all comments before they are posted because we weirdly receive hundreds of SPAM comments a week. Regardless, we truly appreciate you taking the time to check out our blog and leave a comment. We hope to provide even more useful information for you in the future.